On Saturday night, Kickstarter, Tumblr, and SoundCloud welcome you to F*CK YEAH! 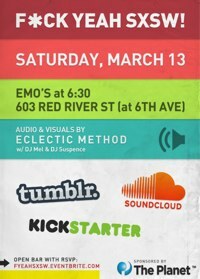 SXSW, a party with music/visuals by Eclectic Method sponsored by the nice folks at ThePlanet. It’s at Emo’s on Saturday night, from 6:30pm until late. On Sunday 11am, I’m doing a solo talk about a mish-mash of my interests, focused around metagames — both games about games, and games built on games. Quite possibly the only talk at SXSW to mention Mechanical Turk, Desert Bus, Barack Obama, VVVVVV, and Metafilter. Also in amazing panels, Kickstarter’s own Perry Chen (Monday w/Robin Sloan), Yancey Strickler (Wednesday w/Allison Weiss), and Fred Benenson. You should go to every one. More details here.